It has been standard practice for businesses to give gifts. Gifts are given to existing customers as a reward for loyalty. They are given to employees as a token of appreciation of their job. They are given to random people in the hopes of converting them into paying customers and finally, they are given to business partners to express thanks. But whatever may be the avowed purpose of the gifts, the underlying purpose is he same. It is a marketing strategy where the gifts actually bear a message which may range from faintly promotional to outright promises. People love these promotional gifts. In fact, [people love anything free, even if it a complete waste of time and space. In addition, if the free stuff actually happens to be useful as well as of good quality, then the company soars in the eyes of the receivers of the gift. This is the perfect way to create goodwill and increase the customer base of your company. The most common promotional gifts include pens, mugs, key chains, calendars and table mats. Tee shirts are also another common promotional item. So, out of all these, why should you go for koozies when you are shopping for your perfect business gift? Koozies are highly useful items. They help to keep your drink in a can or a bottle cool. So, people find them very handy, especially during summer when a cool drink of water or beer is most welcome. Nobody can have too many koozies. It does not matter if the person already possesses one or more koozies. Even extra koozies turn out to be helpful. So, your customers will appreciate this gift and will carry away a positive impression of your company. Koozies can be customized and the possibilities are limitless. A search of the internet will reveal that you can give free reign to your creativity while designing your koozy. You can put as attractive a design on it as you want. If you want bright colors and strong messages, so be it. If you want a discrete emblazoning of logo, that also works fine and everything in between. Compared to a pen or a key chain, koozies have much larger surface area. So, you can put any message you like over it as long as it remains aesthetically pleasing. You should not cover the entire area with writing, but you can insert a small slogan or a large logo to send your message across clearly. The major reason to choose koozies as your promotional gift is the huge amount of exposure your message will get. 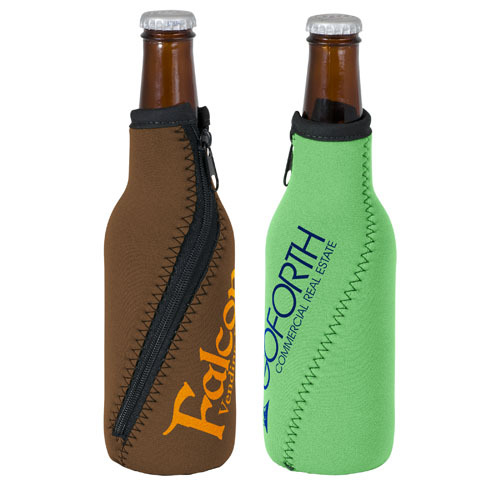 Koozies are used to carry the bottles or cans to public places like the park, a game or others. When people take out their drink and drink it, the messages on the koozies are passed on to every onlooker on sight. So, think, on a busy day in a park, how many pairs of eyes read your message on a koozy? This high degree of exposure is probably the greatest incentive to use koozies as business gifts.